India, a nation that is flooded with cultural symbolism, history and numerous religious practices, has the proud to have Jaipur in its tourism map as it not only reflects the above mentioned practices but also incorporate rich heritage of craft and art. The Nahargarh Fort, which used to guard the Pink City, now overlooks the growth and prosperity of the modern Jaipur. It has seen various chapters of Jaipur history from its existence to India independence and still today, it silently observes the growth of the city. The city of Jaipur, built by Sawai Jai Singh II, was heavily fortified, since the king took a special interest in the security of the area and due to this he began the construction of Nahargarh Fort in the year 1734. The fort is believed to be named after a Mogul Prince and that’s why in certain parts of Nahargarh, the walls are adorned with beautifully painted frescoes depicting the prowess of the Mogul Empire. Located above the city, it allows for wonderful views of the cityscape. Evening proves to be the best time to view the city from Nahargarh Fort as you can see the beautiful city in the day, have a wonderful sunset view from the same and then you can have a look over the city in nights. The city looks like a treasure chest with lots of necklaces and diamonds scattered all over it. It also gives an amazing view of the Jal mahal (the palace built in the lake). Not to be missed when in Jaipur. Nahargarh Fort, when observed from Jaipur, looks like a beautiful palace whose wall hung around the mountain as big arms protecting the city. 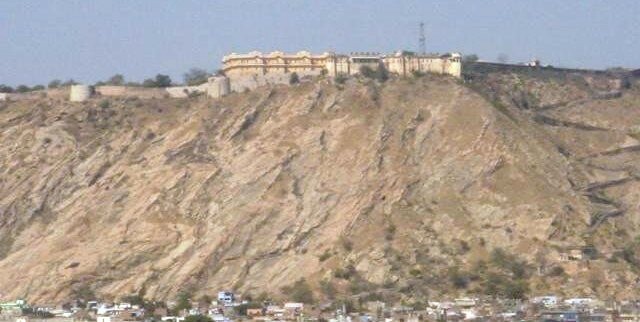 Nahargarh Fort was built with an intention of secure place for protecting its citizen at the time of attack and usually it used to be its military camp area. Inside the Fort, a beautiful palace is made which has lots of window to watch inside the atrium as well as outside. This palace is used by many film makers specially from the Bollywood, latest movie being SHUDH DESI ROMANCE. It has become more a picnic space and lots of local along with tourist flock here to enjoy the cool breeze and lovely views. There are two restaurant and facilities to let you relax and chill. Tags: Best Hotel in Jaipur, Jaipur Travel, Rooftop Restaurant in Jaipur, What to do in Jaipur!